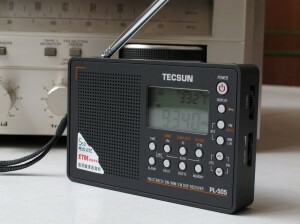 The Tecsun PL-505 portable shortwave radio. The Tecsun PL-505 is a portable DSP based shortwave radio. New to the market in October 2011, the PL-505 is currently only available through vendors in China/Honk Kong on eBay (see search link below). LCD displays the station frequency, Signal Strength, S/N Ratio, Temperature, Battery consumption, etc. Accessories: stereo earphones, external antenna, AA rechargeable batteries, USB cord, line in cable & pouch. This entry was posted in Portables, Tecsun and tagged PL-505, Tecsun, Tecsun PL-505. Bookmark the permalink.